TheGamma lets you create rich and reproducible data-driven articles and reports. We are working on the first version of TheGamma. If you want to be part of the early preview, let us know here! Curious what you can do with TheGamma? 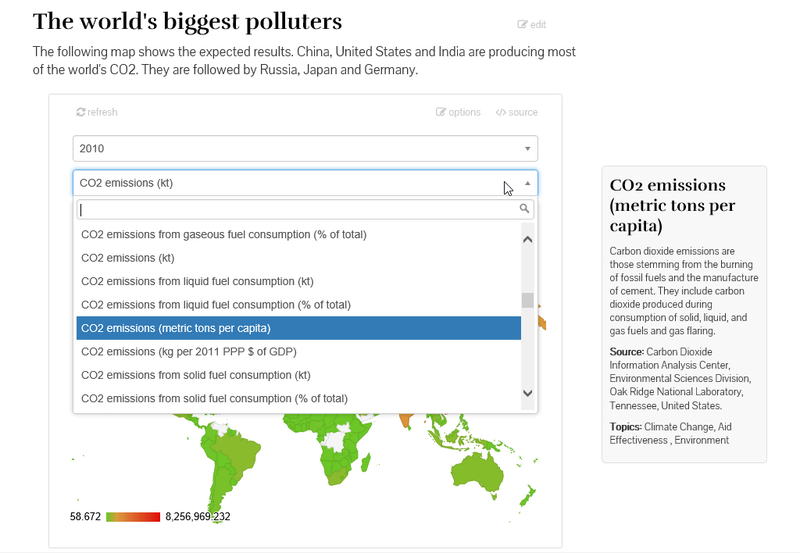 Check out our sample report on carbon emissions using the World Bank data. You could have written it yourself! It is easy. See the report source on GitHub. See the examples below for interesting ways to interact with the report. TheGamma brings programming language research on type providers to a practical, easy to use environment. To learn more, check out our overview article that has been presented at Computation + Journalism Conference 2015 at Brown Institute, Columbia University. Your information is safe with us. We will not share it with anyone, under any circumstances. Brought to you by @tomaspetricek with support from @efLDN.